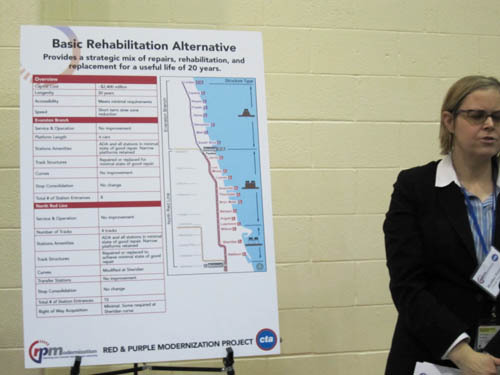 The Chicago Transit Authority and Federal Transit Authority are proposing to make major changes to the Red and Purple Line El tracks in stations in a project called North Red and Purple Modernization Project. Such improvements will re-construct existing transit stations, and bring track systems and old infrastructure to a state of good repair. In addition, help to reduce travel times, and provide access for people with disabilities. Commuter John Ryan Silvia showed up at a scoping meeting in Rogers Park that was hosted by the CTA and FTA. The CTA and FTA ended its final rounds of scoping meetings on Jan. 28. 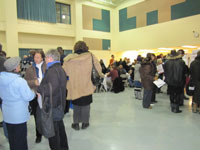 Scoping meetings are “open-houses” that allow the public to review the proposed changes and offer feedback. The North Red and Purple Modernization and its six different alternative will be prepared by a Tier 1 Environmental Impact Statement, which is also known as EIS. The EIS will also examine the environmental issues surrounding the project, such as the location, the land use impacts, and the cumulative effects. Six different alternatives were presented, and left Elizabeth Ro, a frequent CTA rider confused. Each alternative presents a different construction scenario—one alternative keeps the current status quo, while another will provide new transfer stations. Concerned riders are upset with the Modernization 4-Track Alternative and Modernization 2-Track Underground Alternative, which could leave up to 5 el stations closed—Red Line faces losing Lawrence, Thorndale, and Jarvis; while the Purple Line faces losing South Boulevard and Foster. Silvia is not excited about the proposed alternatives. One proposal calls for closing Red Line stops at Lawrence, Thorndale and Jarvis. “I would be enraged if I found out that I have to walk six more blocks to another stop, take a bus, just to make another 2-3 transfers to get to my destination,” he said. It can take up to five or 10 years before neighborhood riders begin to see any sort of construction work, according to the CTA. The CTA did not respond to two requests on funding information. For now, riders who want to voice their concern on the North Red and Purple Modernization Project can submit their comments via e-mail to rpm@transitchicago.com by Feb. 18, post comments below and vote in our poll.